Finally, after many mis-starts and social media product debacles, Google gets their social networking offering down right. The downside is, there’s no reason to call this a “Plus”, it’s just catchup. Historically, Google has been complacent when it goes to social networking, not having realized how quickly Facebook was going to grow many years ago, innovation in this category was lackluster. Amid several attempts most have failed (see the chronology of failed Google attempts), there is hope with yesterday’s announcement. In previous launches, their efforts were mere copies of Facebook’s (+1 vs Like) or struggled with too much complexity (Wave) and privacy woes (see my additional analysis on Google vs Facebook vs Twitter). 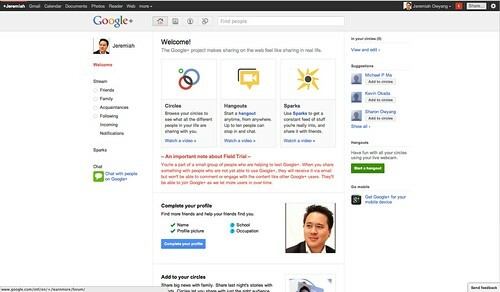 Although I’ve only spent a few hours cruising throughout Google’s latest endeavor, “Google +1” I found myself strangely comfortable with the feature set. Groups (now called “Circles”), A wall with a cascading microfeed, Chat tools, commenting tools. In particular, great care was taken to craft the “Share” feature which makes it crystal clear on which circle or even in public you’ll share information. In the past, both Google and Facebook have miffed on how information will be shared. Being a late adopter has given Google the advantage here, they’ve had a few mistries, seen where Facebook has fallen, and have put the right features together. Yet, despite the familiar balance of features and site structure layout, this looks like a bare bones version of Facebook (minus the excessive ads, applications, yesterday tabs, and confusing user interface). As a result, I don’t see how this differentiates from Facebook. There is one saving grace that could make this tool unique, “Google Sparks” which is a conversation starter around different topics, that could leverage the Google search and media features.While only on the first week, I’ll reserve final judgement, but there isn’t a compelling reason why someone would switch to Google+ after setting up their social connections on Facebook. When it comes to features, Google is at parity with Facebook, but isn’t compelling for a mass immigration of social behavior. They must quickly integrate Google’s unique products like YouTube, Gmail, Apps, and others to slowly attract users over. 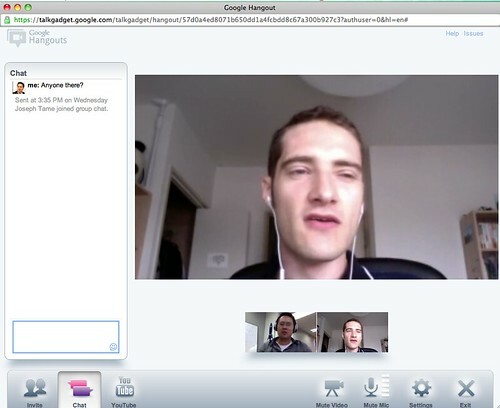 Below is some screenshots, and here’s a link to my public Google+ profile. Altimeter is continuing our mission researching disruptive technologies. In fact, we have yet another survey out in the field, focusing on topics that the cutting-edge company will want to have answer. We’re focusing on Social Media Management Systems, Advocacy Programs, how companies integrate social into their corporate websites, and as a foundation, how they’re preparing inside of their company. While we already have over 250 representatives who have filled out the survey from a variety of communities and mailing lists, I’d also like to offer the survey to readers of the Web Strategy blog in a unique instance of the survey for comparative data. Like previous research reports (see my research tab), they will be available under Creative Commons for anyone to download. Action Requested: Please take our latest survey here, and sign up at the end to be emailed when the reports are live. It’s a simple request, you help spread the word on this survey, and we’ll continue to share our research findings with the open market at no cost. If you’re a client and want to have a live conversation on the research findings, I look forward to the 1:1 discussion. Also, see the recently updated research agenda from Altimeter analyst Alan Webber on disruptive technologies. How should a modern organization factor in mobile devices and social technologies into their learning programs? 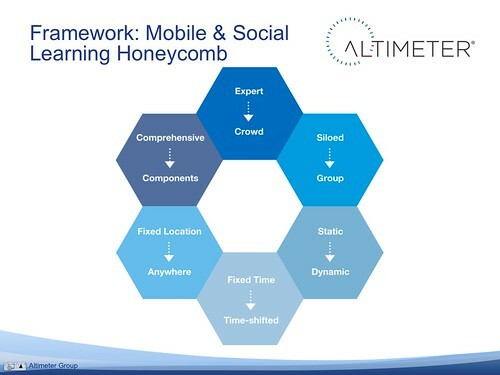 That’s the exact question the Altimeter Group was posed with to answer for the mLearnCon 2011 conference today in San Jose. A big thanks to Researcher Andrew Jones (Twitter, Blog), and Research Intern Andy Nguyen (Twitter), for their help on this research. Update: Clark Quinn created this mindmap of the presentation, thanks Clark. I’ll cross link to any reviews, just leave a comment, here’s a photo from the back of the room, a couple hundred folks, and see this wrap up from David Kelly. Social Media jobs continue to heat up, see this video piece on CNN. The hires in the social business space continue to heat up, in fact the market research data (read the report) shows that hiring is the top spend in 2011. Expect there to be more hires over coming quarters. Both the submissions on this job announcement board, as well as available social media positions at corporations continue to pour in. In this continued digest of job changes, I like to salute those that continue to join the industry in roles focused on social media, see the archives, which I’ve been tracking since Q4, 2007. Rocket Fuel Expands Executive Team; Names Liza Hausman Vice President of Marketing. Congrats to the team, I’ve worked with Liza for a number of years now, and she’s always delivered top quality marketing leadership. Giovanni Rodriguez joins Deloitte Consulting, focused as an Intrapreneur, quite a powerhouse going on over there. Callan Green has been hired as a social media Sr Specialist for Sony Electronics social media team. She comes to us from Bailey Gardiner, a communications firm in San Diego where she was a social media account executive. I’ve met and worked with this world class team in the past, a great group, congrats. Heather	Watkins	joins	Marketo	as	Sr. Manager of Customer Communities & Programs	Heather will be in charge of Marketo’s online community, user groups, user summit & customer reference programming. Marshall	Thompson	joins	Affinitive	as	Community Manager	Day to day operations of social media programs for brands including content strategy, creation, and reporting. Greg	Johnson	joins	MoneyGram International	as	Manager, Interactive Marketing and Social Media	Developing and implementing Brand strategies for interactive marketing channels including web, mobile, and social media across international markets. Mayka	Mei	joins	Red Magnet Media	as	Senior Strategist	Shaping and executing social strategies for creative entertainment and lifestyle brands. Sharif	Renno	joins	U.S. Cellular	as	Social Media Manager	Responsible for the strategy, support, and implementation of social business plans across the organization. Adam	Kmiec	joins	Walgreens	as	Director, Social Media	Enterprise social leadership across internal, external, customer and supplier initiatives. John Kelly	joins	Baynote	as	Chief Operating Officer and Head of Global Sales	At Baynote, Kelly will immediately focus on the rapid expansion of the company’s global sales organization while ensuring organizational alignment across all departments. Mark Tsimelzon	joins	Baynote	as	Chief Development Officer Tsimelzon will be responsible for new product development, scaling the Baynote platform and growing the company’s engineering team. Henry	Min	joins	Passenger as	SVP Product Management	As SVP Product Management, Henry will be the unifying voice of Passenger’s product strategy and execution, combining feedback from sales, marketing, customers and prospects to set the strategic vision and lead the execution on new features and products. Henry will lead a team that will gather and prioritize product and customer requirements to define the product vision, and he will work closely with Engineering to continue to deliver and innovate new products. Miguel	De Anda	joins	Passenger as	VP Engineering	Miguel will manage the engineering team and work closely with the product team to address issues and new requirements to the software platform. Submit a new hire that’s ‘on the move’ with this easy-to-use online form. See the Web Strategy Job Board, which includes paid submissions from the top brands in the world. Please congratulate the new hires by leaving a comment below. What? Are you serious? Who needs a guide on how to take a vacation? As we become more connected through mobile devices, our always-on jobs, and our expanding online social networks, it’s harder to break away from the physical aspects of work, and even more importantly, the developing mental separation from work and daily life woes to really relax and recharge. This was my first time unplugged in a few years, and now that Altimeter Group is continuing to safely grow (and hiring) it was a good time to take two weeks completely away from work, and week completely unplugged in the remote Fiji islands. Well, I should point the finger at myself first, as I live and work, a highly connected lifestyle. It was hard for me to take time off, but I was successfully able to disconnect, both the wireless connection –and mental disconnection from work. I want to share five steps on how to have a successful vacation when you’re a highly connected individual. Step 1: Take a Vacation. Really. Take one. Or at least, plan for one right now. In fact, the American workforce is less likely to take vacation than many other industrialized nations. Even if your budgets or schedule is limited, take a staycation. Lower cost alternatives include camping at your local beach and national park, or even staying in a nice hotel in your home city on the other side of town. Step 2: Properly Plan To Leave Woes Behind. make some deals with your colleagues that they will cover for you when you’re gone, and you’ll do the same for them. Then, let your customers, clients, partners, and other important folks, at least 30 days in advance, to set expectations. Lastly, let folks know you’ll be completely disconnected, and they should send you important emails that require action to your colleagues, or after you return: set expectations. Special thanks to Altimeter’s Julie Viola, Christine Tran, Andrew Jones, Charlene Li, and others for covering for me during my downtime. Step 3: Unplug, Even Forcibly If Needed. So the best way for me to be unplug is to go to an area where there’s no electronic devices, and spent time island in the remote Fiji islands where there’s no cars, TVs, radio, internet, for most islands, you don’t have to go to the other side of the planet to do this, just leave your electronics in the hotel safe. If you truly lack self control, you can disconnect, unpower your devices, or even have your carriers cut off access for a short period of time. Taking time off from social networks (even beyond your vacation) is a good ideas. See what happened when I took a few weeks off from Twitter, my world was just fine. Step 4: Use Your “Idea Freezer”. Physically being on the beach is much different than mentally being on the beach. One trick to deploy is having a way to shed ideas, so you can resume them after you return –without them interfering into your peaceful brain. The best way is to have a ‘mental freezer’ such as a notepad (I always carry a Moleskine see how I use it to stay organized) by the bed stand to write down any invasive work idea came into your head whatever they are. Quickly slay those ideas, by putting pen to paper, and leaving them in the freezer and expanding your mindshare for other ideas. After a few days, you should settle into your relaxing vacation, worry-free. The great thing about the idea freezer is that they will be there when it’s time to come to reality, all thawed out. Step 5: Do a Counter Cycle. It’s so easy to yearn to go back to our daily routine so try new experience to expand your mind. Do something opposite to your daily routine (hence the “counter cycle”): exercise, read leisurely books, or just get some sun I find that mixing with different cultures gives me a unique perspective I can take home and reapply to life and work. For example, spending time with the leisurely Fijians on “Fiji Time” (which is far slower than Hawaiian time) helped me to refocus on what’s really important in life. If you’ve followed these steps, of actually planning, unplugging, then mentally refreshing yourself on your holiday, congratulations, you’ve successfully taken a vacation in a highly connected world, and are ready to return to the land of the connected. Update: Also see Boston Innovation’s group “Why you need a vacation“.